Jersey tomatoes are ripe for the picking these days at our farm. I get so excited when what I call “the perfect trio”, Jersey tomatoes, corn and peaches, are all in season. I’m going out on a limb and claiming that Jersey tomatoes are the best…ever! The taste and flavor of a Jersey tomato are incomparable. A perfect Jersey tomato is sweet, juicy and a deep red color. This fruit, yes, it’s a fruit, is definitely worth waiting for. Plus, there are so many things you can make with fresh tomatoes. Can you believe there was a time in my life when I hated fresh tomatoes. Crazy, isn’t it! 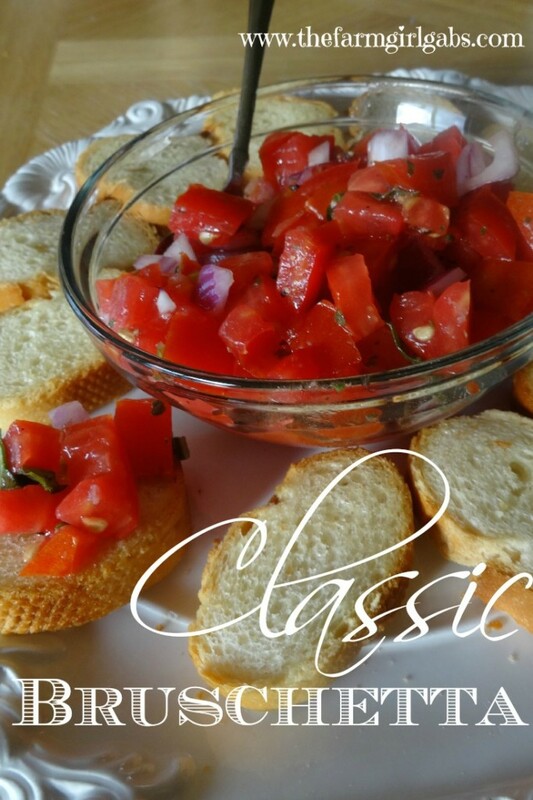 One of my favorite things to make with tomatoes, aside from fresh tomato sauce (or gravy), is classic bruschetta. We enjoy it so much at my house, I make it at least once a week during the summer months. Bruschetta is a great party appetizer too because a little goes a long way. Here is my simple recipe which only takes about 15 minutes to prepare. This is a simple bruschetta that is a perfect party appetizer or just a weeknight treat. Serve with your favorite bread or chips. Finely chop tomatoes and onion. Place in medium size bowl. Add fresh chopped basil and mix to incorporate. Slice baguette loaf and make 1/4" slices. Lay flat on baking sheet and brush with olive oil. Bake at 400 degrees for 10 minutes until lightly browned. I start by chopping up these ripe and juicy Russo’s Jersey plum tomatoes. Aren’t they beautiful! Look at the bright red color. I then chop the onion and garlic and add it to the bowl . I season with salt and fresh cracked pepper. Then add olive oil and mix well. Bruschetta is not complete without fresh basil from my herb garden. I chiffonade (that’s a fancy term that means I roll up the basil and slice into thin strips), the basil and mix in right before serving. I like to serve my bruschetta with crostini toast. Grab yourself some good French bread when you are at the grocery store. I pre-heat my oven to 400º. While oven is preheating, I slice the bread to make 1/4″ slices. I lay them flat on a baking sheet and brush each side with olive oil. I pop them in the oven for 10 minutes until slightly brown. If you wish, rub each slice with a fresh clove of garlic when you remove them from the oven. To plate, arrange crostini on large platter with brushetta in smaller bowl at the center. This is a perfect dish to put all those great tomatoes to use, whether you have an abundance of tomatoes in your garden or you grab some at your local farm market or grocery store. It’s a healthy appetizer too since it’s made with a fresh tomatoes and ingredients. You can’t go wrong with fresh Jersey tomatoes! Let me know how you like it. You have some really nice posts! very pretty and well done. I love bruschetta! Looks fabulous! Would love it if you would come by and share this evening (Tues 7pm EST) at the Wonderful Wednesday Blog Hop! I love bruschetta! One of my favorite appetizers. I have to say, I’m kind of coveting those tomatoes right now! Thank you for linking at the In and Out of the Kitchen Link Party. Hope to see you again next week. Ah-LOVE a fresh bruschetta! I’ve actually never made it myself-your recipe has inspired me! Thanks for joining Pin Your Friday Favorite-again (we love to see you)! Looks dee-lish! I just LOVE bruschetta! Thanks for sharing at the NEW #PinFest! I love tomatoes too, even though I didn’t like them as a kid. I guess it’s just something that grows on you. This looks so delicious! I pinned it to the Retro Re-Pin Party Board.